Kentuck Golf Course Tidal Marsh Restoration (OR) | WEST Consultants, Inc.
WEST Consultants performed hydrologic and hydraulic modeling services for the design of proposed environmental enhancements to a tidally disconnected lowland adjacent to Kentuck Slough in Coos Bay, Oregon. Historically, a golf course occupied the disconnected lowland, which is characterized by two distinct areas on the south side of Kentuck Slough. The “front nine” of the golf course is located in the eastern area and the “back nine” is located in the western area. Plans called for conversion of the entire golf course (both the front and back nines) to a reconnected tidal estuary and wetland (tidal marsh). WEST was tasked to construct a 1D/2D HEC-RAS model of the golf course, slough, and a portion of Coos Bay. 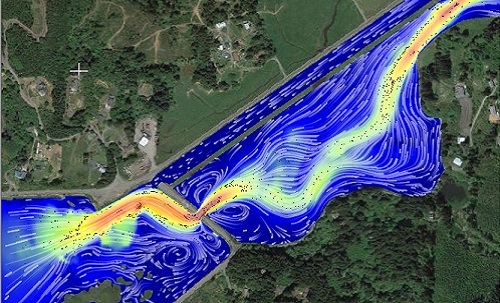 The model was used to identify velocity and shear stress hot spots for scour countermeasure design and to size and locate various infrastructure elements around the site, such as a bridge over the connection between the golf course and Coos Bay, as well as a tide gate array on the upland side of the golf course. WEST also conducted a geomorphologic assessment of the proposed design, including an evaluation of the mobilization of sediments and the evolution of tidal channels within the restored tidal marsh. Adjacent land owners were concerned regarding the potential of saltwater intrusion to pasture lands if a tide gate were to be placed in upstream portions of the slough. Consequently, WEST performed a salinity analysis of the slough and project area. WEST used the 1-D HEC-RAS model to compare the salinity concentrations for existing and proposed conditions.